• Made his 2018-19 debut vs. SAC (10/19), scoring 13 points on a perfect 4-of-4 from the field (3-of-3 from deep). •	Appeared in 30 games (23 with Utah and seven with Denver), averaging 1.9 points in 6.4 minutes. •	Matched a season-high with nine points on 4/15 at Golden State. •	Played a career-high 21 minutes on 1/2 vs. Atlanta, scoring five points and dishing out a career-high four assists. •	Scored a season-high nine points on 1/3 at Minnesota, hitting a career-high three three-pointers (3-of-3 3FG). 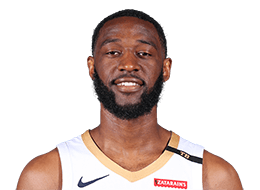 •	Appeared in seven games on assignment with the NBA Development League’s Idaho Stampede, averaging 14.0 points and 2.3 rebounds in 31.9 minutes. •	Appeared in 23 games, averaging 3.0 points in 7.5 minutes. •	Logged a season-high 17 minutes on 11/6 at Boston. •	Scored a career-high 10 points (4-of-5 FG) and grabbed two rebounds on 11/18 vs. Golden State. •	Made his NBA debut on 11/1 at Phoenix, tallying three rebounds, one steal and one block in nine minutes of play. •	DNP-CD 24 times and inactive 35 times. •	Appeared in eight games on assignment with the NBA Development League’s Bakersfield Jam, averaging 12.4 points and 3.3 rebounds in 32.3 minutes. •	Finished his career as Belmont’s NCAA-era all-time leader in points (1,920) and three-point field goals (340). •	Appeared in 133 games for the Bruins, averaging 14.4 points, 2.9 rebounds, 2.2 assists and 1.22 steals while hitting 48.4 percent from the field (681-of-1406 FG) and 42.5 percent from three-point range (340-of-800 3FG). •	Named the Ohio Valley Conference Co-Player of the Year and earned Associated Press All-American Honorable Mention selection as a senior in 2012-13. •	Led Belmont to three consecutive NCAA Tournament berths, earning the team’s highest-ever seed (No. 11) in 2012-13. •	Four-time All-Conference honoree and two-time conference Defensive Player of the Year (Atlantic Sun in 2011-12 and OVC in 2012- 13). • Appeared in 133 games over four seasons at Belmont, averaging 14.4 points, 2.9 rebounds, 2.2 assists and 1.22 steals, shooting .484 from the field and .425 from three-point range • Finished his career as Belmont’s NCAA-era all-time leader in points (1,920) and three-point field goals (340) • 2012-13: Portsmouth Invitational All-Tournament Team • Associated Press All-America Honorable Mention...Naismith and Lou Henson National Player of the Year candidate • National Three-Point Championship Third Place (Final Four) • Lefty Driesell Defensive All-America...Mid-Major All-America • OVC co-Player of the Year • First Team All-OVC • OVC Defensive Player of the Year...OVC All-Tournament Team • Tennessee Sports Writers Association (TSWA) Men's Basketball Player of the Year • Four-time OVC Player of the Week • Three-time TSWA Player of the Year...Great Alaska Shootout All-Tournament Team • UCF All-Tournament Team • Team Captain • 33 game appearances, all starts • Emerged as one of the top all-around shooting guards in the nation • Tremendous shooter with ‘old school’ mid-range game and active defender • 30 double-figure scoring games...Broke program’s career scoring mark in sold-out ESPN BracketBuster victory vs. Ohio (2/23/13) • Third in nation in three-point field goal percentage (.459) • Third in nation in field goal percentage among guards (.543) • 10th in nation in three-point field goals per game (3.09) • 3rd in OVC in scoring (18.2)...9th in OVC in steals per game (1.6) • Career-high 32 points, four rebounds, two blocked shots vs. UT Martin (1/12/13)\ • 21 points vs. Arizona in NCAA Tournament second round (3/21/13) • Would be Atlantic Sun or Ohio Valley Conference career three-point field goals made leader had Belmont been in either league four years • 2011-12: First Team All-Atlantic Sun...Atlantic Sun Defensive Player of the Year...Atlantic Sun All-Tournament Team • CollegeInsider.com Mid Major Defensive All-American • Preseason Atlantic Sun Player of the Year (multiple media outlets) • Started 34 games, tallying double-digit points in 25 of those contests • 34th in NCAA in three-point field goal percentage • Second in Atlantic Sun and 33rd in NCAA in three-point field goals per game • Tallied 23 points (all in the second half) and six rebounds at Stetson (2/13/12) • Notched 16 points, six rebounds in Atlantic Sun Championship vs. Florida Gulf Coast (3/3/12) • 14 points, went over 1,000 career points vs. Troy (12/15/11) • Tallied 12 points, three assists in NCAA Tournament second round game vs. Georgetown (3/16/12)• 2010-11: NABC All-District 3 Second Team...Atlantic Sun Most Valuable Player (CollegeInsider.com)• Honorable Mention Mid Major All-American (CollegeHoops.net)• First Team All-Atlantic Sun • Atlantic Sun All-Tournament Team • Atlantic Sun Player of the Week (1/18/11, 2/21/11) • Preseason All-Atlantic Sun (Sporting News, Athlon, Lindy’s, league office) • Ranked among Atlantic Sun leaders in five statistical categories • Third in Atlantic Sun in three-point field goal percentage, T-7th in three-point field goals per game • 58th in NCAA in effective field goal percentage (Ken Pomeroy) • Led team in scoring (12.2 ppg) • 25 double figure scoring games • Started 35 games, and all 66 games of career • 2009-10: CollegeInsider.com Mid Major Freshman All-American • Sporting News Atlantic Sun Freshman of the Year • Atlantic Sun Freshman of the Year • Second Team All-Atlantic Sun • Atlantic Sun All-Freshman Team • Atlantic Sun Player of the Week (2/8/10) • First freshman of Bruin NCAA era to lead team in scoring • Only Bruin to start all 31 games • Fifth among all NCAA freshmen in made three-point field goals • Among Atlantic Sun leaders in five statistical categories • Third in three-point field goal percentage • Fourth in three-point field goals per game • Fifth in free throw percentage • Eighth in scoring • Team-high 23 double figure scoring games and led team in scoring 17 times • Eight 20-plus point games • At least one three-point field goal in 28 games • Career-high tying 31 points on 9-for-11 three-pointers vs. North Florida (2/7/10), the nine treys put Clark one off of the Curb Event Center record • Career-high-tying 31 points vs. Stetson (1/4/10) • First career double-double of 21 points, 10 rebounds at Stetson (2/18/10) • 21 points in collegiate debut vs. Portland State (11/13/09) • 19 points vs. Mercer in Atlantic Sun Quarterfinal (3/4/10) • Career-high five steals at ETSU (2/1/10). PERSONAL: Full name is Ian Patrick Clark... Son of Jon and Shelbia Clark... Has one sibling, Chris... Majored in Business Administration... Averaged 23 points, five rebounds and five assists as a senior in high school... Was named to the 2009 Tennessee All-Region Team and the 2009 Pepsi/Memphis Commercial Appeal ‘Best of the Preps’ Basketball Team for Class AAA... First player ever from Germantown High School to make the NBA... Played AAU Basketball for Memphis YOMCA... Won back-to-back state titles in middle school... Is on Twitter @IanClark.